First: A Subject which is Socially the most beneficent, of interest to the greatest number of people, and the noblest in Conception. Second: In which the Expression: on the faces of tlhe figures, in the details, and in the work as a whole-expresses profoundly that which the work is supposed to express. Third: In which the Composition is the most sublime. Fourth: In which the Drawing of all forms is the most true and effective in rendering Life, above all-Ideal Life. Fifth: In which the Color is the most varied and rich. Sixth: In which the surface Technique is the most vigor ous, appropriate, and unoffensively individual; the whole work of such a Quality, and so coordinated, as to insure a result, in which a Subject is expressed with the greatest Completeness and Harmony: so as to stir the highest emotions of the largest number of cultured people for the longest period of time. We consider a wvork of art great or trivial in ratio of the clegree to which it measures up to this standard. PORTRAIT-MAKING whether in paint or marble is an art by itself, above all as practised by the vast majority of those artists of to-day to whom it is merely a public highway in which to parade tricks of brush-work in paint or chisel marks in marble. Compared with ideal figure painting and sculpture it is and will always remain a second class art. This is because it requires less invention, less imagination, less poetry to make a first-class por trait than it does to make a first-class dramatic work, such as are the great works which serve as milestones along the historical path of art evolution. Of course, many artists who have made portrait making the main pursuit of their lives and have an inflated idea of its importance will deny this. This is because so few of them are able to detach them selves from their special pursuits and because most of them speak of their “art” when they really mean their “artistry”-their technique and brush-work -and so cannot see that Rembrandtfs artistry is not art a all but mere skill-and that what makes some of his portraits so very fine is not only his painting skill but his remarkable ability to invest his works with beauty of design-design of line and design of color-scheme-which lift them out of the class of mere portraits and put them into the class of imaginative pictures; one or two of them are, in addition, so searchingly interpreta tive as to raise them to the plane of expressive art. Of course, such portrait groups as Velasquez’s “Surrender of Breda” and Rembrandt’s “Syndics of the Drapers” and Hals’s “Banquet Portraits” are superbly expressive creations which command our highest admiration. But while they do rouse the admiration of our intellect, they never command the homage of our soul which is a higher experience than mere admi ration of the mind. It is this which so many of our artists never learn until it is too late. They imagine that when they have surprised or astonished us by their dexterity or even make a decoratively charming composition, they have won a great victory, when in truth they have not reached even the outskirts of the inner sanctum where sits enthroned our ego ever on the alert and anxious for the arrival of lifting and awe-inspiring emotions such as make life for a man of fine culture really worth while. This is largely due also to the fact that many of our artists are mere dilettanti who have hugged to their breasts the childish and parasitical notion that an artist should never think of making any sort of appeal to the public-which is only another name for the universal consciousness; that he should think only of expressing himself in his own way; to paint, carve and write when he wants, what he wants and how he wants, and if the public does not like his work it can pass it by, ignoring the fact that a truly great artist will never be content to simply amuse himself with merely expressing his own capricious emotions like a Hottentot playing on a sand pile in the African jungle, but who will ever have before him the social soul with an ever burning desire to stir the emotions of mankind, to captivate it by producing works which as Taine truly said will forcefully appeal both to the humble and great. Certain it is that it is impossible to call any portrait picture a sublime creation, unless we except Leonardo’s “Last Supper” as a collection of portraits of Christ and his apostles. Therefore, in our analyses this month we will confine ourselves to portraits. 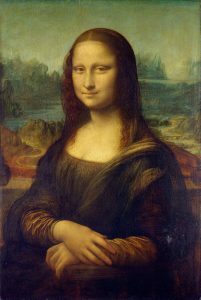 One’ of the greatest portraits of all time and perhaps the most mysterious and curiosity-arous ing is Leonardo’s “Mona Lisa” or as it is often called “La Joconde.” Why is this a great portrait? In the first place the whole work radiates a cer tain distinction, all is refined and uncommon; one feels the lady is a born aristocrat. Briefly Leonardo conceived this portrait on a lofty plane as befits an artist who feels that true democracy in life and art means the people plus the aristocracy, refinement plus power. This distinction of conception was already settled upon in his mind before he began to compose this picture. Second, having conceived his portrait on a high aristocratic plane, he began the expression of that distinction by giving it a monumental lifting character by composing it in a triangular or pyra midal mass, the two folded arms making the base line of the triangular contour. It is this pyramidali zation which invests the picture with that perennial lifting power which we cannot escape and helps to give it its eternal distinction and nobility. But no matter how it occurred, it is certain that Leonardo roused this mental state in his sitter, saw it, was highly emotioned by it and the impact of the impression was powerful enough to make it unforgetable to his great mind with its wonderful visualizing power. Taking an oath in heaven that he would forever fix that mental state on his canvas, he worked on it for four years until he triumphed and endowed the world with a gem of living art second to none among all the portraits of the world. Is the Mona Lisa beautiful? Yes and no. She is not beautiful to those who by instinct look for a fleshy beauty; her features are too irregular, too delicate and unsensual; but to such as love a certain amount of sensuousness, yet long for spirituality and intellect in an otherwise physically strong woman, she has a profound and abiding fascination. This portrait is another proof among the many Leonardo gave, that the power of expressing with profundity of expression on the face of a figure, of that emotion which the figure is supposed to express, is the most necessary and therefore the highest element of art power. Therefore, this con summate masterpiece coupled with his “Last Supper” lifts Leonardo to that pinnacle where dwell only the great artists of the world. Further, I repeat, this expression is obtained by the marvelous draw ing and modeling of Leonardo. Fifth, as to color: there remains little to be said since it has sombered somewhat with age. But we can say that the chosen color-scheme, a warm gray-scheme-harmonized, as it should, with the person and the mental state Leonardo aimed to portray. Sixth and last: the technique or painting is of that impersonal kind which makes it seem as if any consummate artist might have painted it; and yet it is personal enough to force us to feel that no other artist painted in just that manner. Therefore Leonardo here in this portrait wins out in every element of art power and distances nearly all of his competitors in the history of the art of portraiture. Not only does the “Mona Lisa” suggest Mona Lisa searching the soul of the great Leonardo while he painted her, and with whom she was, most likely, also discreetly in love, but she typifies the eternal feminine, ever kindly, even when most pes simistic, eternally inquisitive even when most cer tain, and ever skeptical even when most optimistic. Thus she is at once a type of a particular transient woman and a symbol of the everlasting feminine. Hence she at once makes an individual and universal appeal. Thus in this case Leonardo lifted portrait-making out of the category of merely representative art, beyond which few portraits ever go and places it in the highest category, that of expressive art; and he did his largely by spurning all childish stunts in “artistry” and those pitiably petty and “temperamental” and “personal” tricks of an egotis tic and parading mannerismn so dear to the vaude ville craftsman. And he did it finally with such rare and subtle power that the “Mona Lisa” will ever seem mysterious to those who cannot penetrate beyond the surface of things, but for those who see deeply he made of it not only a mere decorative record of a person, but a beautiful poetic creation which across the centuries has roused the emotions of prince, priest and peasant. That is why it is great and why it will always remain as a model for every portrait artist who wishes to achieve a place in the affections of people to whom poetic and spiritual art makes a supreme appeal.